If you find this explanation helpful and want daily market commentary, investment tools and explainer videos head on over to Ramin’s new site at PensionCraft.com and please tell us what you think! As nights grow longer and the temperature falls most northern Europeans console themselves with thoughts of holidays in the sunshine. Some enterprising individuals even buy a holiday home closer to the Equator. Why not buy a nice, spacious home in Florida with a swimming pool, a refrigerator the size of a garage and a garage the size of a house? Property is relatively cheap in the USA at the moment so on the face of it this could make a lot of sense. However, hidden inside this transaction is a massive currency risk. Let us say we take out a nice, cheap 30 year US mortgage where we are paying just 5% interest. The payments are in dollars but we are paid in euro. Each month we have to convert some money from euro to dollars, put it in our US account and use that money to pay the mortgage. We may start to notice that although our US interest rate is fixed at 5% our monthly payments start to increase as the euro weakens against the dollar. We will feel the full pain if money flees the struggling European economy to the safe haven of the dollar and the euro tumbles in value. European banks also have dollar liabilities and find themselves in exactly the same situation as a European with a US mortgage. As the euro falls against the dollar the cost of these payments increases. The situation is not helped by US investors becoming reluctant to lend to any entity related to Europe, particularly banks. European banks are having trouble getting any form of dollar funding. Fortunately banks have a powerful financial tool at their disposal called a cross-currency basis swap. This allows the bank to raise funding in Europe in euro and transform this into dollars at a fixed currency exchange rate that is agreed up front. The basis swap will allow the bank to transform their dollar liability into a euro liability which they can fund more easily. Banks are continually borrowing and lending to one another. Usually they pay and receive variable interest based on a rate published daily by the British Banker’s Association. These rates are called LIBOR (London Interbank Offered Rate) and there are rates for each major currency and term of borrowing from 1 month up to 1 year. For example a loan in dollars would pay a rate that would change every three months based on the value of three month US dollar LIBOR. In Europe the interbank offered rate is EURIBOR. What European banks expect from a cross-currency basis swap is conversion of their variable dollar LIBOR payments to EURIBOR payments. 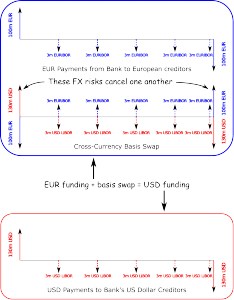 The cross-currency basis swap will convert the lump sum that the bank borrowed in euro into a lump sum in dollars. When the term of the borrowing is complete it will convert the principal back from dollars to euro at exactly the same fixed currency rate that is agreed up front. This means the swap is unaffected by fluctuations in the EURUSD exchange rate because the principal exchange at the beginning and end of the swap’s life cancel one another perfectly. Having sorted out the principal payments the basis swap must also convert the interest payments. Every three months the bank will pay their European creditors at, say, the three month EURIBOR rate. Their cross-currency basis swap will re-imburse their euro payment by paying the bank an almost offsetting euro payment. At the same time the bank will pay their swap counterparty floating dollar payments at the US dollar three month LIBOR rate. The net effect is to make their euro loan look like a US dollar loan while taking no foreign exchange risk because the FX rates are fixed, as illustrated below. 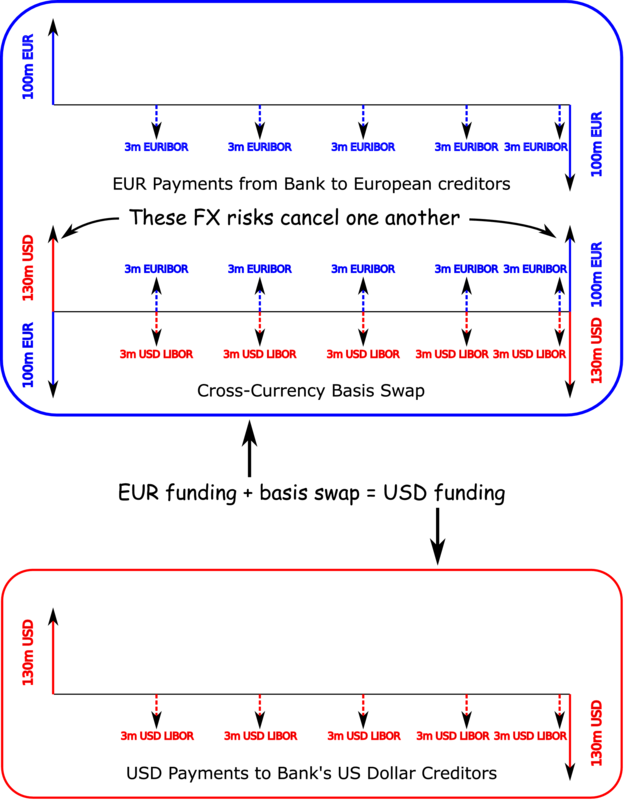 Arrows above the line are payments made to the bank and below the line are payments made by the bank to others. A dashed line is a floating payment that depends on the as yet unknown value of three month EURIBOR or USD LIBOR. Of course nothing in life is free, so the bank has to pay for this cash flow alchemy in some way. The counterparty in the cross-currency basis swap will actually pay the bank a little less than the EURIBOR rate and pockets the difference between the EURIBOR rate and the rate on the swap. If banks are desperate for dollar funding they will be willing to receive less interest on the euro interest on the swap. Cross-currency basis swaps are quoted as this difference in interest received. Turning this around it is now extremely cheap for US banks to convert euro liabilities into dollars. As demand for dollar funding has increased the euro dollar basis swap rate has fallen sharply and has become strongly negative. In a concerted move to make dollar funding available to European banks several central banks (the Federal Reserve in the US, the Bank of England, the Swiss National Bank and the Bank of Japan) have now stepped in and offered to act as swap counterparty in cross-currency basis swaps at EURIBOR + 0.5%. However the euro swap rate continues to fall just as it did during the credit crisis in 2008/2009 driven by growing demand for dollars and European banks’ growing difficulty obtaining dollar funding. 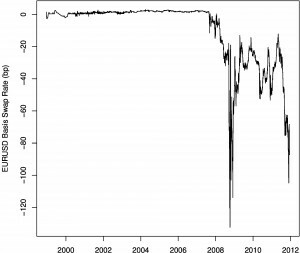 This graph shows the one year EURUSD cross-currency basis swap rate. 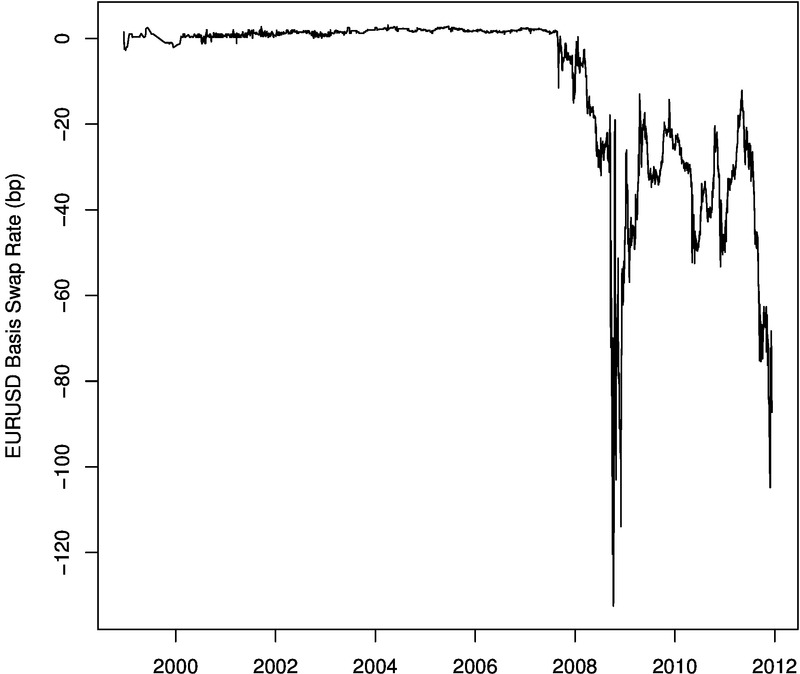 We are not too far away from the rate seen after the collapse of Lehman in 2008 when the swap rate fell below -1.2%. Usually the rate is measured in units called basis points (bp) where 1 basis point is 0.01%. Why would the Fed offer to help banks in Europe? Banks are globally interconnected because they continually borrow and lend money with one another and trade risk with one another through derivatives. If one global systemically important financial institution (click here to download the official list) were to fail, as Lehman did, then this could cause a global chain reaction of defaults in the banking system. Central banks have acted in concert to provide dollar funding by providing cross-currency basis swaps. This seemingly obscure and complicated financial instrument has helped to reduce the risk of another global banking crisis. You can find out more about the way cross-currency basis swaps work in Chapter 6 of the Financial Bestiary which is about all kinds of swaps, including a detailed description of interest rate swaps which are the most commonly traded interest rate derivative. If you liked this explanation buy the book! My Financial Bestiary contains this kind of simple, intuitive explanation for every asset class and has all 5* reviews on Amazon. Click on the links below to buy a paper copy of the book or use the add to cart button to buy a PDF version.